Yevgeny Ivanovich Zamyatin (1884-1937) was a naval architect by profession and a writer by nature. His favorite idea was the absolute freedom of the human personality to create, to imagine, to love, to make mistakes, and to change the world. This made him a highly inconvenient citizen of two despotisms, the tsarist and the Communist, both of which exiled him, the first for a year, the latter forever. He wrote short stories, plays, and essays, but his masterpiece is We, written in 1920-21 and soon thereafter translated into most of the languages of the world. It first appeared in Russia only in 1988. It is the archetype of the modern dystopia, or anti-utopia; a great prose poem on the fate that might befall all of us if we surrender our individual selves to some collective dream of technology and fail in the vigilance that is the price of freedom. George Orwell, the author of 1984, acknowledged his debt to Zamyatin. 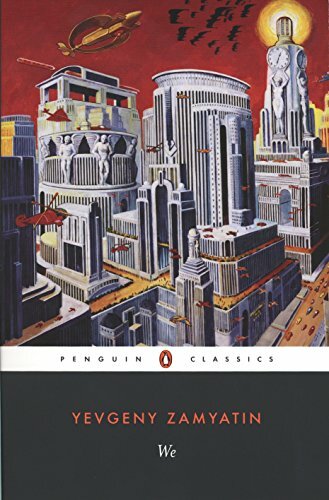 The other great English dystopia of our time, Aldous Huxley's Brave New World, was evidently written out of the same impulse, though without direct knowledge of Zamyatin's We. Clarence Brown is the author of several works on the Russian poetOsip Mandelstam. He is editor of The Portable Twentieth-Century RussianReader, which contains his translation of Zamyatin's short story "TheCave," and of Yury Olesha's novel Enpy.